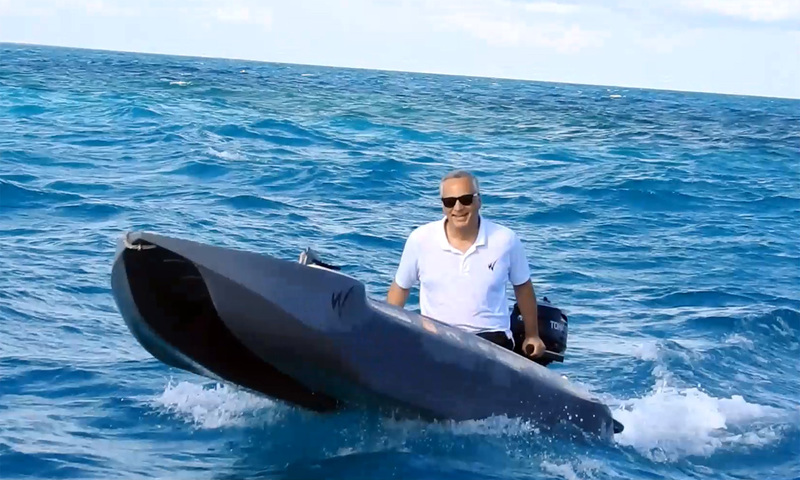 Wavewalk S4 driven in choppy blue water in the Atlantic ocean close to Key Largo, Florida. It was fun to drive this watercraft that seems to be almost immune to waves, wherever they come from. Hopping on waves and making sharp turns was easy solo and with a passenger on board. 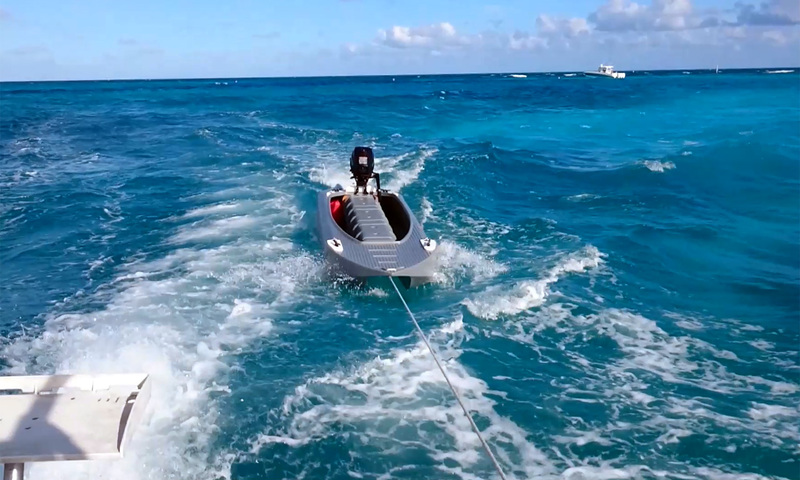 We towed it behind the mother ship, and it was a pleasure to watch how well it behaved… It can serve as a perfect boat tender for a big boat or a yacht – It’s seaworthy, comfortable, fun to drive and to paddle, can be beached anywhere, and it can carry up to three people on board. 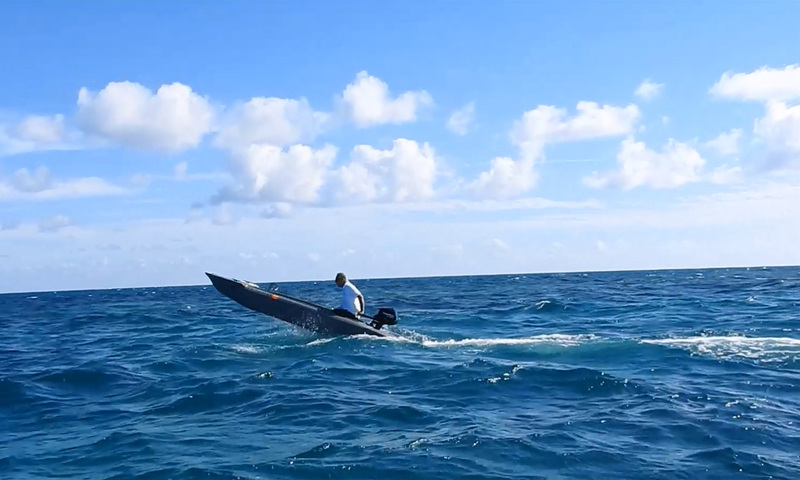 The S4 in this movie is under powered by a 3.5 HP outboard motor – A 6 HP outboard would have worked better in this case, but still, driving this ultralight microskiff in the chop was a lot of fun. Thankfully, the S4 is not a solo skiff, and driving it with a charming passenger on board was even more fun. We didn’t have to outfit it with a spray shield, as hardly any spray got it. Special thanks to Captain Larry Jarboe of Wavewalk Adventures in Key Largo. Wow….pretty impressive, Larry. Can’t believe you didn’t need the spray shield. Glad you’re back playing on the water after taking care of Irma’s aftermath. S4 Handles in choppy seas. Looks like possibilities for a whole new market. Yep, from boat tenders to rescue, pleasure, etc. Thanks to Larry we shot more footage in Key Largo, and more movies are coming. 1) The S4 will not deflate or need patches to keep from deflating. 2) The S4 planes across the water on less horsepower. 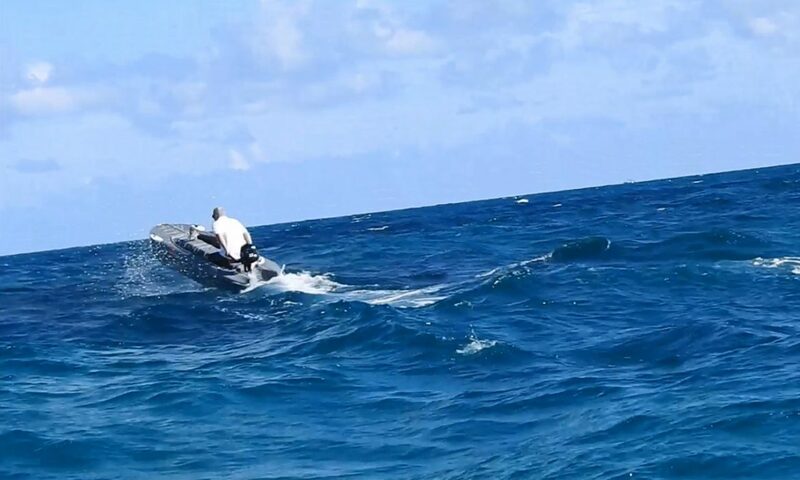 Note how well that lightweight 3.5 hp outboard makes the S4 skim over the waves. 3) The S4 can be strapped and stored upside down overhead on a T-top or welded frame to create a waterproof shaded canopy that doubles as a lifeboat. 4) The S4 is a lot sexier looking than a rubber raft. The inflatable dinghy design sacrifices sensible hydrodynamics for extra stability achieved through excessive width.